There’s a big difference between assessment of risk and the perception of risk. As Wildavsky points out above, Americans are frightened of risks. He and other scholars of risk have located that fear in the large gulf between assessment and perception. What’s the difference between risk assessment and risk perception? Risk assessment is the mathematical determination of a specific risk, and is usually carried out by professionals in statistics or related disciplines. Risk perception is the belief about a specific risk and is typically the province of lay people. As scholars of risk have noted, there is often a wide gulf between actual risk and lay belief about risk. When it comes to advances in health and science, the American public often perceives far more risk than the risk assessment demonstrates. The actions taken in response to that fear, can often be more dangerous than the particular risk that is feared. Alternative health practices like vaccine rejectionism and homebirth, arise in that wide gulf between assessment and perception. Risk perception is modified by factors that have nothing to do with actual risk. According to David Kane in Science and Risk: How Safe is Safe Enough, these factors include “newness” of the risk, control, and benefits. What does he mean by “newness of the risk”? 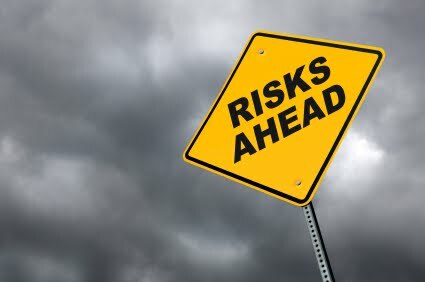 Generally, a risk that has always existed is regarded as an acceptable risk, while newer risks that are brought to the public eye receive greater scrutiny. This intense examination makes the new risk appear to be more dangerous. That is especially true when the magnitude of the risk is unknown to many (the risk of death during childbirth) or has not been directly witnessed (the risk of death from vaccine preventable diseases). It is also affected by the naturalistic fallacy, the claim that the way that things were is the way that they ought to be. Natural childbirth advocates routinely believe that the risks of technology are far higher than the risks of “natural” birth. The second factor is control. An individual is more willing to accept the risk of an activity of which he or she is in direct control… This underlying factor explains why … indirectly controlled activities have a high perceived risk. A key type of control is the decision to be exposed to a risk. Voluntary risks involve this kind of choice, while involuntary risks lack this element of control. Because voluntary risks involve a choice based on an individual’s own set of values, [research has shown that] the acceptance levels are a thousand times greater than those of involuntary risks. For example, even when homebirth advocates are apprised of the increased risk of neonatal death, many will still choose homebirth. It seems to them that the risk they choose (to have a homebirth) must be smaller than risk of hospital birth. The third factor is benefits. The public is only willing to tolerate a minute level of risk for activities which it considers to be of little value, such as constructing nuclear power plants. Conversely, for those events which the public perceives great benefit, the acceptance level is quite high. Kane includes a graph that dramatically illustrates this phenomenon. Here’s a modified version of the graph. 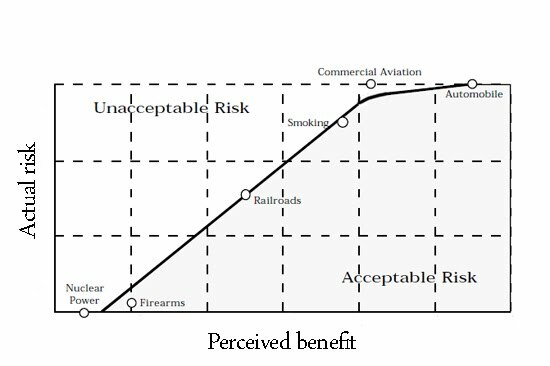 As the graph demonstrates, large risks are considered acceptable if the benefits are valued highly. For these reasons, vaccine rejectionists’ perceived risk of vaccination is much higher than the actual risk. Vaccine rejectionists perceive the risks of “new” vaccinations are far higher than “old diseases.” They are more frightened of risks posed by mandated vaccination than the far higher dangers of voluntarily rejecting vaccines. And since they don’t understand the magnitude of the benefit, they erroneous conclude that risk of vaccination is not acceptable. Similarly, for homebirth advocates the risk of hospital technology are perceived as far higher than the risk of birth in the traditional venue of the home. They are far more frightened by the risks of undesired hospital policies than the far higher dangers of freely chosen homebirth. And for those who understand that the risk of neonatal death is higher at homebirth, it is judged acceptable because the perceived benefits are valued so highly. Both vaccine rejectionists and homebirth advocates need to understand that their perceptions of risk are totally out of line with actual risk. Until they do, they will continue to erroneously believe that dangerous choices are safe, and safe choices are dangerous. ← If correlation is not causation, what is?